This week we were assigned to teach a community course giving a brief overview of some CAM (Complementary and Alternative Medicine) offerings. I chose to focus on those that are actually offered in my local area, there are several CAM practices that I have left out, and some of them might actually be offered in my area, but just not “google-able”. My primary reference site of choice is the NCCAM/ NIH because these are the federal oversight agencies that regulate CAM. THE NEXT ((HUGE)) SECTION IS DIRECTLY FROM THE ABOVE WEBSITE. So, What Term Does NCCAM Use? “Complementary and alternative medicine,” “complementary medicine,” “alternative medicine,” “integrative medicine”—we have all seen these terms on the Internet and in marketing, but what do they really mean? While the terms are often used to mean the array of health care approaches with a history of use or origins outside of mainstream medicine, they are actually hard to define and may mean different things to different people. This fact sheet looks into these terms to help you understand them better, and gives you a brief picture of NCCAM’s mission and role in this area of research. “Complementary” generally refers to using a non-mainstream approach together with conventional medicine. “Alternative” refers to using a non-mainstream approach in place of conventional medicine. True alternative medicine is not common. Most people use non-mainstream approaches along with conventional treatments. And the boundaries between complementary and conventional medicine overlap and change with time. For example, guided imagery and massage, both once considered complementary or alternative, are used regularly in some hospitals to help with pain management. This array of non-mainstream health care approaches may also be considered part of integrative medicine or integrative health care. For example, cancer treatment centers with integrative health care programs may offer services such asacupuncture and meditation to help manage symptoms and side effects for patients who are receiving conventional cancer treatments such as chemotherapy. It’s happening now. Many individuals, health care providers, and health care systems are integrating various practices with origins outside of mainstream medicine into treatment and health promotion. The integrative trend is growing among providers and health care systems. Driving factors include marketing of integrative care by health care providers to consumers who perceive benefits to health or well-being, and emerging evidence that some of the perceived benefits are real or meaningful. The scientific evidence is limited. In many instances, a lack of reliable data makes it difficult for people to make informed decisions about using integrative health care. NCCAM generally uses the term “complementary health approaches” when discussing the practices and products we study for various health conditions. When thinking about our research portfolio, we often find it useful to consider these approaches as generally falling into one of two subgroups—natural products or mind and body practices. This group includes a variety of products, such as herbs (also known as botanicals), vitamins and minerals, and probiotics. They are widely marketed, readily available to consumers, and often sold asdietary supplements. Interest in and use of natural products have grown considerably in the past few decades. According to the 2007 National Health Interview Survey (NHIS), which included a comprehensive survey on the use of complementary health approaches by Americans, 17.7 percent of American adults had used a nonvitamin/nonmineral natural product in the past year. These products were the most popular complementary health approaches among both adults and children. The most commonly used natural product among adults in the past 30 days was fish oil/omega 3s (reported by 37.4 percent of all adults who said they used natural products); popular products for children (taken in the past 30 days) included echinacea (37.2 percent) and fish oil/omega 3s (30.5 percent). Some of these products have been studied in large, placebo-controlled trials, many of which have failed to show anticipated effects. Research on others to determine whether they are effective and safe is ongoing. While there are indications that some may be helpful, more needs to be learned about the effects of these products in the human body and about their safety and potential interactions with medicines and with other natural products. Acupuncture is a technique in which practitioners stimulate specific points on the body—most often by inserting thin needles through the skin. Massage therapy includes many different techniques in which practitioners manually manipulate the soft tissues of the body. Most meditation techniques, such as mindfulness meditation or transcendental meditation, involve ways in which a person learns to focus attention. Movement therapies include a broad range of Eastern and Western movement-based approaches; examples include Feldenkrais method, Alexander technique, Pilates, Rolfing Structural Integration, and Trager psychophysical integration. Relaxation techniques, such as breathing exercises, guided imagery, and progressive muscle relaxation, are designed to produce the body’s natural relaxation response. Spinal manipulation is practiced by health care professionals such as chiropractors, osteopathic physicians, naturopathic physicians, physical therapists, and some medical doctors. Practitioners perform spinal manipulation by using their hands or a device to apply a controlled force to a joint of the spine. The amount of force applied depends on the form of manipulation used. Tai chi and qi gong are practices from traditional Chinese medicine that combine specific movements or postures, coordinated breathing, and mental focus. The various styles of yoga used for health purposes typically combine physical postures or movement, breathing techniques, and meditation. Other examples of mind and body practices include healing touch and hypnotherapy. 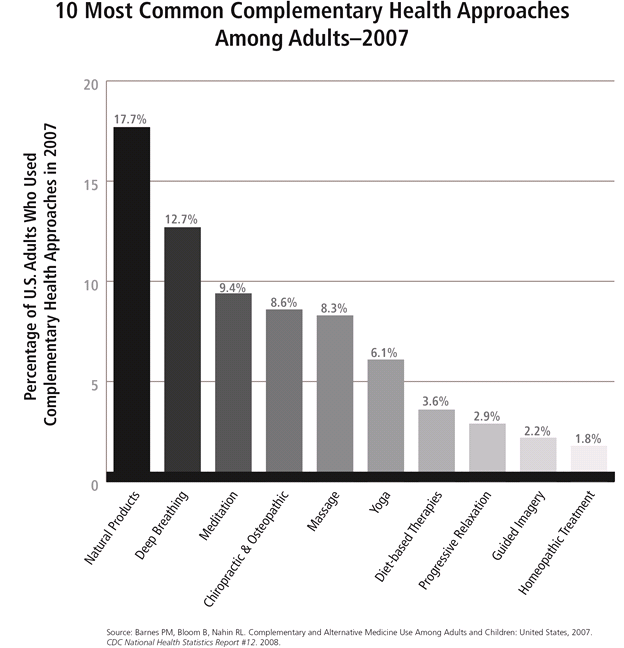 According to the 2007 NHIS, several mind and body practices ranked among the top complementary health approaches used by adults. The mind and body practices most commonly used included deep breathing, meditation, chiropractic and osteopathic manipulation, massage, yoga, progressive relaxation, and guided imagery (see graph). The amount of research on mind and body approaches varies widely depending on the practice. For example, acupuncture, yoga, spinal manipulation, and meditation have had many studies, and some of these practices appear to hold promise in pain management, whereas other practices have had little research to date. The two broad areas—natural products and mind and body practices—capture most complementary health approaches. However, some approaches may not neatly fit into either of these groups—for example, the practices of traditional healers, Ayurvedic medicine from India, traditional Chinese medicine,homeopathy, and naturopathy. The mission of NCCAM is to define, through rigorous scientific investigation, the usefulness and safety of complementary health approaches and their roles in improving health care. NCCAM’s vision is that scientific evidence will inform decisionmaking by the public, by health care professionals, and by health policymakers regarding use and integration of complementary health approaches. To learn more, visit the NCCAM Facts-at-a-Glance and Mission page at nccam.nih.gov/about/ataglance. NCCAM’s current strategic plan, Exploring the Science of Complementary and Alternative Medicine: Third Strategic Plan 2011–2015, presents a series of goals and objectives to guide NCCAM in determining priorities for future research on complementary health approaches. The NCCAM Clearinghouse provides information on NCCAM and complementary health approaches, including publications and searches of Federal databases of scientific and medical literature. The Clearinghouse does not provide medical advice, treatment recommendations, or referrals to practitioners.